Why 170mm ? - cornelius-kapfingers Webseite! 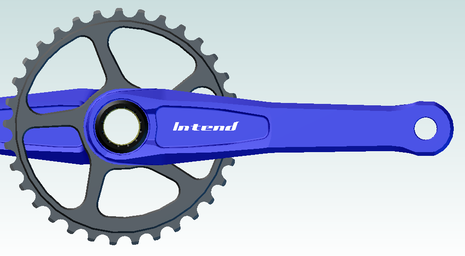 There was a strong wish for a crankset in CNC, in nice and strong - an "own" crankset. What is the ideal structure of a crankset ? Is it with steel, aluminium, maybe carbon? Due to the pedalthreads and the axle-profile there are necessary aluminiumparts. To avoid to have a combination of 3 different components, aluminium is the best solution. One singe piece of aluminium. If you attach two pieces together, welding, pressing or clamping - there is always the risk, that this joint fails. The best engineering is, to avoid this joint. That's why every crankarm is from a single piece of aluminium. The raw material is a round profile. This promises a solid and ideal structure of the raw aluminum. If you look at a crankarm like on a limb of a tree, there are 2 kinds of loads on it. On the left side you see how the crankset gets loaded under pedaling. This results in the 2 kinds of loads seen on picture 2 and 3. To handle best with the first load the crankarm has to have a massive structure on the side of the main axle. The more material there is, the more resistance it has against load 1. The material on the side of the pedal does not play a huge role in this kind of load. To maximize the resistance for load 1, the crankset is made with a conical shape. This also looks graceful. 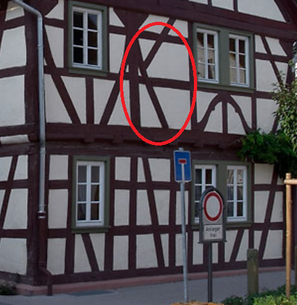 Like you can see on the picture on the left, there is a diagonal rib in the H-profile. This gives even better stiffness then a hollow-construction, because this does not allow the outer parts to move. Exactly like the old houses have it. The next point is the clamp of the left arm and the axle. The best, easiest and most noiseless combination of this two parts is the same like shimano cranks have. With one difference: I use a 10mm hollow titan bolt. This gives a lot of clamping force. To improve the clamping force further, the bolt has to be as near as possible to the axle outer surface. 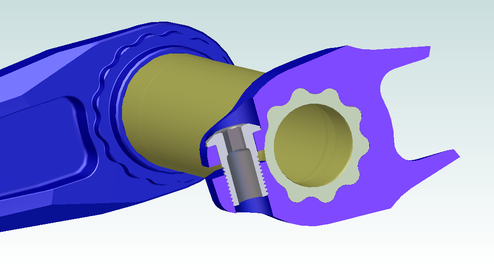 That's why the profile of the axle is interupted in this area, and the titan bolt can come as close as possible. Jan Frodeno rides 172,5mm cranklength. He is the leading the Iron Man circus and he is 1,93m tall. How can this be ? He is the fastest rider, and he rides shorter cranks as the always claimed "perfect length" of 175mm. There are several articles who found out that from a range of around 160 to 210mm cranklength there is no affect to the summed up power. Yes, the maximum force with the same gear ratio is higher with longer cranks. But riding a bicycle is not about the maximum force. This case does happen very very rare at a bicycle. You never use your maximum force also for competing in a cross country worldcup. It is the summed up power which is important for 1,5 h racing. If you would use your maximum power you can bring on the pedal for one moment you maybe are gone in 2 minutes. 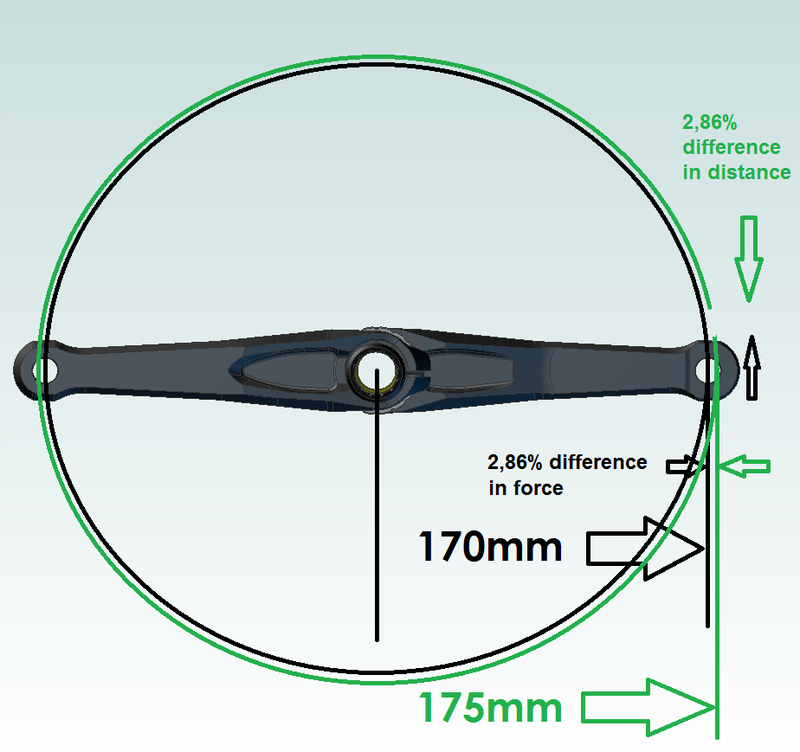 With a 170mm crank instead of 175mm you have around 1068,1mm of circular distance instead of 1099,6mm. In percent this is 31,5mm / 1099,6mm = 0,0286 - This means you have a shorter distance around 2,86% when you switch from 175 to 170mm. If the needed Energy is Force x Distance it does not matter what you increase and decrease, as long you decrease one of it in the same way like you increase the other. You win significant pedal freedrom in rough terrain, especially with modern low bottom bracket bikes. 5mm. This is a huge difference in power if you hit a rock on a technical uphil. THIS lowers your power. Also you can really pedal like YOU want, and not how the track tells you how to pedal.